What exactly is insulin resistance? One of insulin’s jobs is to help move glucose from the blood into the cells for energy. When blood glucose remains elevated despite normal or high levels of insulin, this is called insulin resistance. The cells are resisting insulin’s pleas to take up glucose. But why is this happening? 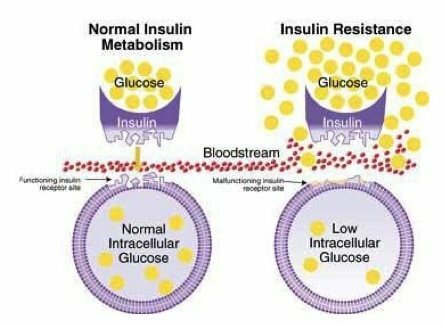 What causes insulin resistance? 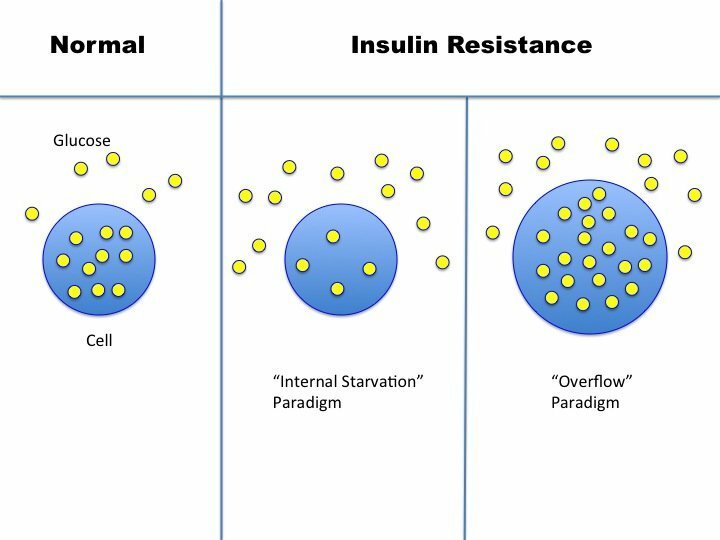 The current paradigm of understanding insulin resistance is the ‘lock and key’ model. The hormone insulin acts upon a cell surface receptor to do its job. The insulin receptor is like a lock keeping the gates to the cell closed. Insulin is like the proper key. When inserted, the gate opens to let glucose from the blood inside the cell for energy. Once you remove the key (insulin), the gate closes back up and blood glucose can no longer enter the cell. During the phenomenon of insulin resistance, we imagine that the lock and key no longer fit together very well. The key (insulin) only partially opens the lock (receptor) and not very easily. Glucose cannot pass through the gate normally, and as a result, less gets into the cell. The blood glucose piles up outside the gate, becoming detectable as the clinical diagnosis of type 2 diabetes is made. Because the cell has less glucose inside, this has been described as a state of ‘internal starvation’. The body’s knee-jerk reaction is to increase insulin production. Since each key works efficiently, the body compensates by producing more keys than usual. This hyperinsulinemia ensures that enough glucose gets into the cells to meet its energy requirement. A nice, neat theory. Too bad it has no basis in reality. First, is the problem the key (insulin), or the lock (insulin receptor)? It’s quite easy these days to determine the molecular structure of both insulin and the insulin receptor. Comparing type 2 diabetic patients with normal patients, it immediately becomes clear that there is nothing wrong with either the insulin or the receptor. So what’s the deal? If both the key and lock look normal, then the only remaining possibility is that there is something that is gumming up the mechanism. Some kind of blocker interferes with the interaction of the lock and key. But what? Here’s where the trouble starts. All kinds of theories try to explain what is blocking the insulin. Without a clear understanding of what caused the insulin resistance, we have no chance of treating it. All the usual buzzwords come out when doctors and researchers have no real clue as to what is going on. Inflammation. Oxidative Stress. Free Radicals. While these may sound impressive, they merely reflect our ignorance, shedding no light upon the root cause of insulin resistance. These are all cop-out answers. Inflammation, like oxidative stress and free radicals, are merely non-specific response to injury. But what causes the injury in the first place? That’s the real problem that needs to be solved. Imagine that we are battlefield surgeons. After several decades experience, we deduce that blood is bad for health. After all, every time we see blood, bad things are happening. When we don’t see blood, bad things are not happening. Therefore, blood is dangerous. So, deciding that blood is what is killing people, we invent a machine to suction blood out of people before it can cause illness. In medieval times, of course, leeches were used. Genius! The problem, of course, is what’s causing the bleeding, rather than the blood itself. Look for the root cause. Bleeding’s only the response, not the cause. Bleeding is a marker for disease. So are inflammation, oxidative stress, free radicals and all the other typical answers. Gunshots, knife wounds, and shrapnel all cause bleeding, the body’s non-specific response. Those are root causes. When you get shot, you bleed. But the problem is the gunshot, not the bleeding. The blood is a marker for the disease, rather than the disease itself. Fever is another example of a non-specific response to infection and injury. Fever is a good marker for infection. When we find a fever, there is often an underlying infection. But the fever did not cause the infection. Bacteria or viruses are the underlying cause. The same logic applies to inflammation, oxidative stress and free radicals. Something is causing injury, which stimulates inflammation, oxidative stress and free radical formation, which are all the body’s non-specific response. The problem is whatever caused injury, not the inflammation, oxidative stress and inflammation, which is simply markers of disease. If inflammation were actually the root cause of heart disease, for example, then anti-inflammatory medications, such as prednisone or non-steroidal anti-inflammatories would be effective in reducing heart disease. But they are not beneficial at all. They are only useful for those diseases where excess inflammation is truly the root cause, such as asthma, rheumatoid arthritis, or lupus. The exact same logic applies to oxidative stress, which is a marker of disease, but not a causal factor. Some underlying injury is causing the oxidative stress, which needs to be treated. This is the reason why antioxidant therapy is so startlingly ineffective. Vitamin C, or E or N-acetylcysteine or other antioxidant therapies, when tested rigorously, fail to prevent disease. Saying that, “Insulin resistance is caused by inflammation” is like saying, “gunshot wounds are caused by bleeding”. Not useful. However, inflammation, bleeding and fever are all useful markers of disease and treatment efficacy. They mark the presence of the disease. If the fever breaks, then the treatment (antibiotic) is highly likely to be effective. Inflammatory markers can also be good markers for the effectiveness of treatment. If insulin therapy decreases inflammation, then this is likely an effective treatment. Sadly, it does not. Without understanding the root cause of insulin resistance, we have no hope of properly treating it. This lock and key model with ‘internal starvation’ is a nice story but cannot explain many of the phenomena observed in type 2 diabetes. In particular, it fails to explain the central paradox of insulin resistance. Recall that insulin normally goes up when you eat. Insulin acts predominantly in the liver to help store incoming food energy. Insulin instructs the liver to do two things. In a state of high insulin resistance, such as type 2 diabetes, both actions of insulin should be simultaneously blunted. This certainly hold true for the first action of insulin. Insulin yells at the liver to stop making new glucose, but the liver continues to pump it out. Glucose spills out into the blood, provoking the body to increase insulin levels. In an insulin resistant state, the second action of insulin should also be blunted, but is paradoxically enhanced. Using the old lock and key paradigm, the insulin resistant liver does not allow glucose through the gate leading to ‘internal starvation’. In this circumstance, the liver cannot create new fat and DNL should shut down. But in fact, DNL not only continues and actually increases. So insulin’s effect is not blunted but accelerated! In fact, there is so much new fat being generated, that there is nowhere to put it. This leads to excess accumulation of fat inside the liver, where there normally should be none. Liver fat should be low, not high. But type 2 diabetes is strongly associated with excessive fat accumulation in the liver. How can the liver selectively resist one of insulin’s effect of insulin yet accelerate the other? This happens in the very same cell, in response to the very same levels of insulin, with the very same insulin receptor. This makes no sense whatsoever. Insulin sensitivity is reduced and enhanced at the exact same time and in the exact same place! Despite decades of ongoing research and millions of dollars, all the world’s top researchers were still stumped by this central paradox of insulin resistance. Research papers were written. Different hypotheses were proposed, but all failed because the old ‘lock and key’ paradigm of insulin resistance with internal starvation was incorrect. Like a house built on a crumbling foundation, the entire underlying premise of treatment of type 2 diabetes disintegrated. How can we explain this apparent paradox? The vital clue is that insulin itself causes insulin resistance. The primary problem is not the insulin resistance, but the hyperinsulinemia. Insulin resistance refers to the fact that for a given amount of insulin, it is more difficult to move glucose into the cell. But this does not necessarily mean that the gate is jammed. There are other possibilities why glucose cannot get into that resistant cell. Perhaps the glucose cannot enter the cell because it is already overflowing. The new paradigm of insulin resistance as an overflow phenomenon resolves the central paradox. This changes EVERYTHING. If you believe the old ‘lock and key/ internal cellular starvation’ model, then the appropriate treatment is to increase insulin as much as needed to push that pesky glucose into the cell. That has been the way we have treated type 2 diabetes for the last 50 years. And it’s been a complete disaster. The ACCORD/ ADVANCE/ VADT/ TECOS/ SAVIOR/ ORIGIN randomized controlled trials all proved the failure of this paradigm. However, if the ‘overflow’ paradigm is correct, then increasing insulin to push more glucose into an overflowing cell is EXACTLY wrong! This would only make diabetes worse. Which is EXACTLY what we see clinically. As we prescribe insulin to type 2 diabetes, patients don’t get better, they get worse. Their blood glucose is better, but they gain weight and they still develop all the complications – heart disease, stroke, kidney disease, blindness etc. The correct treatment of the overflow paradigm is to empty out the BODY, not just the blood of the excessive glucose. How? LCHF and intermittent fasting. And guess what? That’s EXACTLY what we see clinically. As we start fasting type 2 diabetes patients, they lose weight, their medication requirements go down and eventually it reverses. I think the problem over is that insulin by itself is oxidative for the cell, that makes by a down regulation system, that the cell protect itself of the oxidative status that it could damage it. So, it become insulin resistent, in a attemp to reduce the oxidative state that would lead to cell injury. Sudden onset of permanent insulin resistance in a very thin female adult during and post pregnancy. Why does it happen? Yeah, what Jan said! Also, isn’t it a known side effect of pregnancy for women to appear to be, in that short term, diabetic and that that resolves post delivery? Exactly. It’s called gestational diabetes. i had it with both of my pregnancies and it does “go away” after delivery. The endocrinologist told me that I had a 50/50 chance of developing diabetes later in life. Well I did about 27 years later. What the doctors fail to tell their patients is how they can improve their odds by curing their insulin resistance. It’s probably because they don’t know how to cure it either because there’s no drug they can push for insulin resistance. Anora, I have seen videos by Lustig about sugar, where he talks about the only two natural times where insulin resistance occurs naturally: puberty and pregnancy. These are times when the body wants to hoard as much energy as possible, so insulin resistance causes higher insulin which blocks leptin. If the person is very thin, it may well be that there is no insulin excess, but rather, excessively LOW insulin levels. Measure insulin, fasting and after a reasonably carby meal (oatmeal for example) and measure antibodies relevant to Type 1 diabetes. Post-pregnancy is also a risky time for the development of autoimmunity. Consider also gluten sensitivity which can jack up glucose levels (when you consume wheat). Even better, find a doctor who understands that thin hyperglycemic people can have adult onset type 1, and knows what to do about that. LCHF and IF worked good for the first 3 weeks. FBS came down from 180 to 118. but when I started reducing the drugs, it again raised. when reduced the medication to 1/4 of what I was taking, the FBS raised to 200. I increased medication to 1/2 of original, it came down to 170, after2 months of starting LCHF. Is it OK? dawn phenominon? MY fasting insulin is only 3.81 mu/ml. should I make any changes in the diet or anything? Three weeks? That’s it? I’ve been on low carb, then LC + IF, then IF + LC/ketogenic for three YEARS. And I still have blood sugar > 100 in the morning due to dawn effect. Give it some time, like a year. I recommend eating as much fat, particularly animal fat, as possible. Mix up your fasting: miss breakfast for most days; skip lunch also a few days a week; maybe eat breakfast sometimes; throw in some longer fasts. Excellent post! Thank you so much! My fasting insulin is 3.81 mu/ml only. As per Homa2 scale, beta cell function is 12.6% only. IR is 0.59 only. Sensitivity is 169%. I am diabetic for the last 10 years . I am on LCHF and skipping breakfast. I am on LCHF and skipping breakfast. What further action to be done. Today I checked my FBS. Came down from 209 to 139 mg/dL, within 13 days, keeping same level of medications (metformin 500+ glimepiride 1 mg). I am continuing LCHF and short term fasts. This give me hope. An excellent article and I’m a believer in the overflow hypothesis, but has much research been done to confirm or deny that theory? Does this support the “overflow” paradigm? In the diabetic disease state beta cell release of insulin does not turn off alpha cell release of glucagon and so yes, the liver keeps releasing glucose. I suspect drugs will be coming out before too long targeting that instead of just pumping more insulin. This hypotheses sound so good, that I’d like to believe in it. However, there is type 3 diabetes, that is, Alzheimer’s disease, where brains are starving of glucose in spite of high blood sugar. It can even be monitored by a PET scan. How can that be explained? Have a look at this article by Dr. Georgia Ede. It provides a good explanation. and maybe a fatty liver secretes massive amounts of baseline-glucose trying to become less fat? This study is not contradicting your hypotheses and puts insulins role in glucose metabolism into controlling liver gluconeogenesis only. So, kind of supports your theory. But even this can not explain the starving of brain of glucose in Alzheimer’s disease. I’m puzzled. This is a really interesting post. But I am confused on this point: is not insulin resistance usually demonstrated with a glucose tolerance test in a fasted state? If the paradigm you propose is correct, shouldn’t the test fail to show resistance because the test is administered after the liver’s glycogen is depleted? Or is the fasting window for the test usually insufficient to demonstrate insulin sensitivity when the body is emptied? Theories, studies and data abound. For me I figure why not try LCHF and IF? If it doesn’t work medications will still be there. How can this be tested and proven in a laboratory? Look for and view the presentation by Dr Roy Taylor called “Reversing the Irreversible”. He shows baseline, 1 week, and 8 week results of what appears to be glucose tolerance / blood insulin data. Outstanding presentation. Excellent comment. Thank goodness for Dr. Fung and what he does to enable us to improve our health. He truly is a healing angel. A missing word in the fourth paragraph? Since each key works **less** efficiently, the body compensates by producing more keys than usual. Thanks Dr J. My daughter got her Fasting Insulin blood test result yesterday and it was 17. She is very concerned as she should be. She got all of the IDM blood tests and everything else was pretty good. I had mine done 6 months ago and it was 14. However following Megan’s and all of your IDM advice the next blood test read 4 and that was only 6 weeks later . Fasting really helped me lower mine. Good that you have corrected the word in the sentence or it would mislead the people like us . Hence you have mentioned that the body compensates by producing more keys than usual. Is it the body or pancreas that compensates? I am asking this for my better understanding. I am still confused. I was excited to read this article by Dr. Fung. As I was studying about diabetes. The standard insulin resistance model didn’t make sense to me. What did makes sense was that the cells are full they have had enough to eat and don’t want anymore. Which seems to be similar to Dr Fung overflow Theory. You forget to mention the role of high intensity, glycolitically demanding activity like sprinting and intense strength training to use muscle (and liver) glycogen, thus creating storage for incoming glucose. I totally agree that IF and LCHF works great for improving insulin sensitivity, but so does exercise, if it’s well thought out and attacked with the right sort of intensity. How do you incorporate heavy resistance training into your practice with your insulin resistant patients? Great comment Stephan. My ‘lay person’ motivational construct is: keto is for the liver, exercise is for the muscles and fasting is for the brain. Simplistic, but I work best when things are simple. Which modifies the insulin . Which then is not the key that fits the lock . Because if the cell lets the modified insulin into the cell . This may result in cell death . So we are left with glucose intolerance . Until you stop eating drinking dietary methanol . And wait for the damage to repair . If it can ?????? This just isn’t going to fly. There is far too much clarity of thought and insightfulness for any conventional medical doctors to accept. Wait a minute, I’ve got questions. First, why do the cells full of glucose not just burn it up? Second, how does the overflow paradigm explain why hyperinsulinemia causes the liver cells to reverse only one of the two processes they normally reverse when insulin is present? If the overflow theory is correct, then why do we become even more insulin resistant while in ketosis? When the body senses there are no/ little incoming carbs, it starts sparing glucose for the cells that could not survive without it, like red blood cells and brain. It is a normal, reversible process that minimize glucose consumption by making muscle and fat non-responsive to insulin signalling. Eat carbs for a couple of days, and you will become more insulin sensitive than before starting keto. I would very much like to read Jason Fung’s thoughts about gestational diabetes and how it is linked (or not) to hormones. Why do I get low blood sugar (and intense sugar cravings that are, otherwise inexistent) the week before my periods? I feel like there’s a strong connexion between my hormone cycles and the way my body handles sugar levels and insulin. I have a question about prolonged fasting…. Is it okay/healthy/normal to see BUN drop below 3 mg/dL with a prolonged fast? Update: 2 weeks of 20/4. No snacking! LCHF macros pretty on target. Tracking macros on MFP so calories tracked. Averaging 800 but some days 1400 some days 600 just because I wasn’t hungry. I did not have the ability to check my A1C but I plan to. 5 pound lost and dropped through the plateau by 1pound so far. I am eternally grateful that you and George Thomas below, took the time to encourage me. I’m going to get to that goal! Great article! However, overflow theory brings us right back to overeating and overeating brings us to calories counting as a method to avoid glucose overflow in the cell. Overflow paradigm is used often by the people who are against low carb diet. As for my taste, it is great concept since it also explains PIR well. But again it points to the idea that overeating is the problems, not carbs. So I’m not sure how a LCHF fat diet can fix diabetes. Perhaps it reduces the symptoms but as soon as carbs return the symptoms return. Dr. Jason Fung, I’m 67 years old, diabetic type2 from 46 years, taking 80 u of insulin per day and NASH since last 15 years, and I don’t get to reduce sugar ( ~170) nor insulin (~57). I’ve seen recently your approach for diabetic desease by reducing insuline resistance through LCH and intermitent fasting and I would like to try it. I live in Rio de Janeiro, Brasil, and would appreciate if you may have an indication for a doctor who follows your program. I would wonder his/everyone’s take on the studies showing different “resting” or natural insulin levels in people, i.e. even with fasting some people have a higher level of insulin naturally occurring in their body. I have PCOS and am morbidly obese. I recently bought and read Dr. Fungs new fasting book. I know I should be doing the protocol discussed in the book for the most obese. The 2 weeks fast plus the 42 hour fasts a week. But… I think I deal with food addiction (not even sugar or junk food addiction) and sometimes the urge to binge is like an addict. I wonder if you have any insight about that issue? Shannon, I hope you got some help! If you’re still struggling and want to start fasting, you might find it easier if you first adopt a low carb diet, then reduce your carbs further to fit into the ketogenic diet, before starting to fast. The change to your system resulting from low carb and keto ways of eating will teach your body to switch to ketones, which is helpful to tolerate extended fasting. I think also given your health issues it would be smart to have a doctor’s supervision if you undertake a very long extended fast like two weeks. I dont uderstand how this theory can explain the ongoing GNG while the liver have insulin resistance . If the cell is overflowing with sugar why he keeps making new sugar? The internal starvation theory can explain it. Since the cell not feeling any sugar around he keep making more of it because he thinking that there is not enough sugar in the blood. But how the overflowing theory can explain it? restricted ketogenic diet, an effective alternative therapy for malignant brain cancer. Nutr Metab. I have fasted for 24 hours twice now and both times and I swear my bones hurt quite badly throughout my entire body but my knees and fingers in particular. I felt very stiff and so I’m wondering if fastsing enhances or speeds up the effects of arthritis in any way?? Should I be taking a supplement of some kind? Or just stop trying to fast? I certainly don’t want to speed up arthritis and I didn’t really feel anything like that before I tried the fasting. If anyone has advice, I’d greatly appreciate it. Thanks! Is this a typo ? Efficiently instead of Inefficiently ? Otherwise, I cannot make sense of it. I’m not a native speaker so sorry if I’m just missing a point. Jason. I was pointed at this article, by a reader of my blog. I have now advised everyone that reads my stuff reads this. It is, or course, just basic common sense – if you understand human physiology that is. The answer is, of course. All of them. Dr.Jason Fung – Thanks Malcolm. It seems like common sense to me too.